Patriots-Colts Week 5, Key Matchups, Who Has the Razor’s Edge? The New England Patriots host a Thursday Night Football game for the first time this season against the Indianapolis Colts. It is an important game for both teams as the Patriots are trying to stay on the winning track after dropping two in a row. The Colts are trying to get back on the winning track after dropping two close games to the Eagles and Texans. This week’s game will be broadcast by Fox on Thursday, October 4 at 8:20 PM ET and can be seen locally on WFXT Channel 25. Joe Buck will handle play-by-play duties with Troy Aikman as the color analyst. Erin Andrews and Kristina Pink will work from the sidelines. The game will also be aired on the Patriots flagship radio station 98.5 The Sports Hub with Bob Socci and Scott Zolak on the call, produced by Marc Capello. The Patriots (2-2) defeated the Miami Dolphins 38-7 to even their record at .500. The Patriots dominated on both sides of the ball, holding Ryan Tannehill to just 100 yards passing. Sony Michel had 112 yards rushing, Tom Brady threw for 274 yards and three touchdowns. James White had a touchdown rushing and receiving. The Colts (1-3) dropped a heart-breaking 37-34 overtime loss to the Houston Texans. Andrew Luck threw for 464 yards and 4 TDs, completing 40 of 62 passes. Luck completed passes to eight different receivers and the Colts had five receivers with 50 yards or more. The Patriots and the Colts are playing for the 81st time in a series dominated by the Patriots. New England holds a 51-29 overall lead in the all-time series lead including a 4-1 advantage in the postseason. At home, the Patriots hold an all-time 29-12 lead. They have won the last seven matchups and are 5-0 against Andrew Luck including two playoff victories. 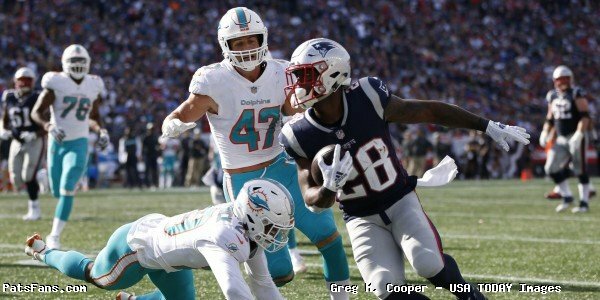 The Patriots running game showed some definite signs of life last week with the team racking up 175 yards against the Dolphins. Sony Michel led the way with 112 yards on 25 carries with a touchdown. James White added 44 more including a 22-yard touchdown run. The coaches have made a concerted effort to remain balanced this year and this game with a short prep week, look for more of the same. The Colts aren’t the team that the Patriots routinely gashed left and right a few years ago. They’re bigger and built much better to stop the run than those sieve-like teams. They have a good size front four with former Patriot Jabaal Sheard at one end and big Margus Hunt at the other with Al Woods and Denico Autry inside. Look for the Patriots to continue to their balanced attack and keep mixing things up against the Colts defense. The defense played nearly a 5-quarter game on Sunday and was on the field for 83 snaps. That may begin to take a toll on the road team in the fourth quarter. Especially if the Patriots can get ahead early and keep the pressure on them. The Patriots passing game looked much better with the addition of Josh Gordon last week. This week they add Julian Edelman back into the mix. That is a good sign for New England. With Phillip Dorsett and Chris Hogan more complementary type of receivers, they will be placed in a much better position to succeed. With James White and Michel out of the backfield and Cordarelle Patterson as a small package type of player, all of a sudden, Brady has plenty of weapons to work with. The only question is whether Rob Gronkowski’s ankle will allow him to play. The Colts are allowing about 268 yards per game thru the air. If Gronkowski is able to go this week, it will put them in a very difficult position to win many matchups. However, they did get seven sacks against Houston last week, two of which came from Autry inside. They’ll need that kind of push this week. Look for Brady to test the Colts corners (Kenny Moore and Nate Hairston) with Gordon and Edelman. White is the X-Factor in the offense, as with his full complement of receivers this week, Brady may be able to find mismatches for his talented running back. Their linebackers are young and inexperienced but have been playing really well. If Gronkowski is available to play (I’d lean toward no right now), then his matchup will be the key one to watch. The Colts haven’t replaced Frank Gore yet although two rookies (Jordan Wilkins and Nyheim Hines) look to eventually have the team in good shape. The Colts are having trouble running the football this year, averaging just 72 yards per game. The Patriots had been getting gashed via the run until last week’s game against the Dolphins. They did a much better job against Miami holding them to just 56 yards on the ground. However, in the pivotal first half, Miami had six carries for seven yards. Malcom Brown and Danny Shelton were much better last week as was the play of the linebackers. Look for Luck to pass to run. They’d love to get their backs going and get in favorable positions in terms of downs and yardage, but the Patriots should be able to slow them down enough to force Luck and the Colts into having to throw the ball. Elandon Roberts, who had a big game on Sunday left early with an injury, we’ll see what his availability is this week. The Indy passing game has been limited thus far to the no-huddle, up-tempo short yardage game as they’ve wanted to ease Luck back into things and not do too much right away. That has led some to believe that his arm strength is gone. While it probably isn’t where it was a few years ago, it will grow stronger as the season wears on. Luck’s most dangerous weapon, T.Y. Hilton is injured with a hamstring problem right now and may not play this week. That would really limit the stretching of the field that the Colts enjoy with him. He’ll lean heavily on Hines, out of the backfield who is the team’s leading receiver with 22 catches and Ryan Grant along tight end Eric Ebron. Jack Doyle is also injured with a bad hip. The Patriots played much better coverage last week, getting aggressive and physical with the wide receivers off the line. The cornerbacks easily had their best game of the year and if the Colts are minus their best WR it is a plus for NE. Look for the Patriots to get more aggressive and try to put more pressure on Luck this week to generate some extra pass rush. Newcomer John Simon may see some extra work against his former team this week. The Patriots and Colts Special Teams both have very reliable kickers and punters. Adam Vinatieri was called the best kicker in NFL history by Bill Belichick this week, and unlike other times where he pumps the opponent’s tires, he isn’t stretching much there. The ageless Vinatieri is still money on FGs and EPs. The Colts have an excellent punter in Rigoberto Sanchez. The Patriots tandem of Ryan Allen and Stephen Gostkowski are an excellent tandem of their own. Except for the year Gostkowski was injured, the Patriots have had only two kickers (Vinatieri or Gostkowski) for the past 23 years. Both teams have solid coverage units. The Colts return game is stuck in neutral while the Patriots return men Cordarrelle Patterson and Cyrus Jones are just starting to show some life. Thursday Night Games are always difficult to get a good feel for. With a very short week to prepare, you never know what you’re going to get. The Patriots have always traditionally prepared well for the short-week Thursday night contests. We’re going to stick with what has been working and that is the Patriots will continue their winning streak against the Colts, especially at home until they show that they can win one here. You have to factor in the Colts defense played 83 snaps on Sunday afternoon and they could still have some residual effect from that overtime contest. Factor in they may be missing their best wide receiver in Hilton and it adds to balance sheet for New England. Brady will have Julian Edelman back this week for the first real game since the Super Bowl against Atlanta, so expect that they’ll try to get him involved early, but then limit his usage until he gets his game legs under him. I’d look for Indy to line up Hairston their bigger corner on Gordon which should be a good matchup to watch. 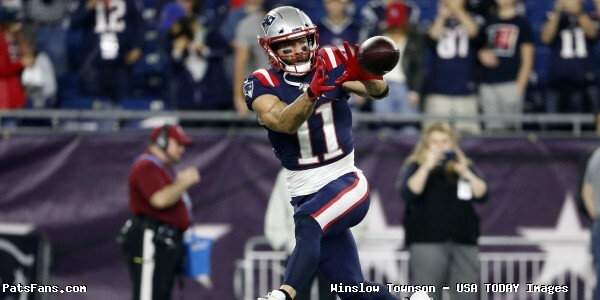 This entry was posted in 2018 Patriots Regular Season, NFL Commentary, NFL News, Patriots Commentary, Patriots Film Room, Patriots News and tagged 2018 NFL Season, 2018 Patriots season, Andrew Luck, Bill Belichick, Chris Hogan, Dont'a Hightower, Frank Reich, Indianapolis Colts, Jabaal Sheard, James White, Julian Edelman, Miami Dolphins, New England Patriots, NFL, Patriots, Patriots edge rushers, Rob Gronkowski, T.Y. 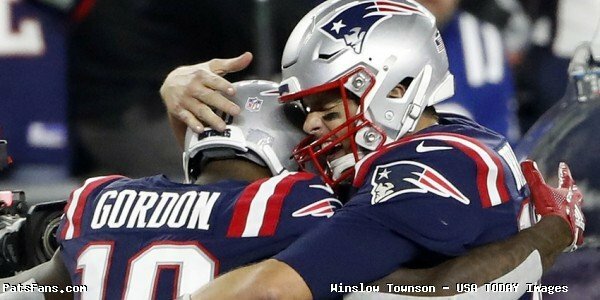 Hilton, Tom Brady, Trey Flowers on October 3, 2018 by Steve Balestrieri. NFL Week 8 wraps up tonight with the 6-0 Carolina Panthers hosting the 3-4 Indianapolis Colts. The game kicks off at 8:30 pm eastern time and will be broadcast on ESPN. After an off-season where many in the media predicted the Colts would play in (if not win) the Super Bowl, Indy has underachieved dramatically. The Colts have lost three games that they were favored to win and enter this game on a two-game losing streak. Things could actually be worse for Indy; they are fortunate that, despite their geographic location, they play in the AFC South. Indy is 3-0 within their division, barely (average of four points) beating three of the worst teams in the league. Outside the friendly confines of the AFC South the Colts are 0-4 this year; over the last two years Indy is 14-0 within the division and 6-10 against the rest of the NFL. Odds: The betting line in this game has been all over the place. A week a go in advanced look-ahead lines, this game opened up 3½ point favorites. By Saturday the line was up to seven points, but on Monday it was back down to 5½ points at most venues, with a few down as low as five points. The over/under is 46 with a half point variance either way depending on where you shop, and a typical money line has Indy +200 and Carolina -240. Against the spread the Colts are 2-5, while the Panthers are 5-1. The Colts are going to go as far as Andrew Luck will carry them, and so far this season the results have not been pretty. Luck ranks at or near the bottom of the NFL among all starting quarterbacks in nearly every passing statistic, and now he has to face a very solid defense that excels in coverage, led by Josh Norman. The Defensive Player of the Month has four interceptions – including to pick-sixes – ten passes defensed, a forced fumble, a fumble recovery and two tackles for losses. Carolina’s ground and pound offense should have no problem with Indy’s soft run defense, and in addition Indy’s man coverage should open up wide running lanes for Cam Newton to take off for big gains if the Panther receivers are covered. The Colts have benefited from undisciplined play of their opponents in their three wins, but that certainly will not be the case with the Carolina defense. The only remaining question is who will Indianapolis G.M. 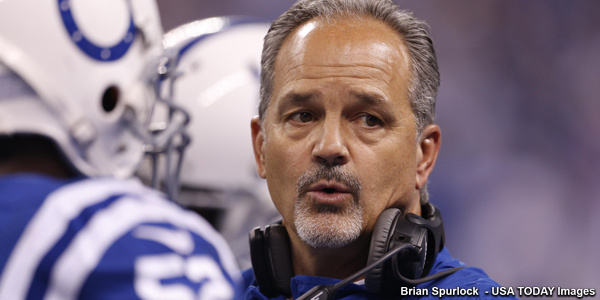 Ryan Grigson get into a heated exchange with first: owner Jim Irsay or head coach Chuck Pagano? This entry was posted in Uncategorized and tagged 2015 NFL Season, against the spread, Andrew Luck, Carolina Panthers, game preview, Indianapolis Colts, odds, picks, predictions, Week 8 on November 2, 2015 by John Morgan. In the end, the results were oh so similar to what we’ve seen so many times. Bill Belichick and the Patriots are in the heads of so many of their opponents, that they psyche themselves out and do silly things at the most in-opportune time to insure defeat. 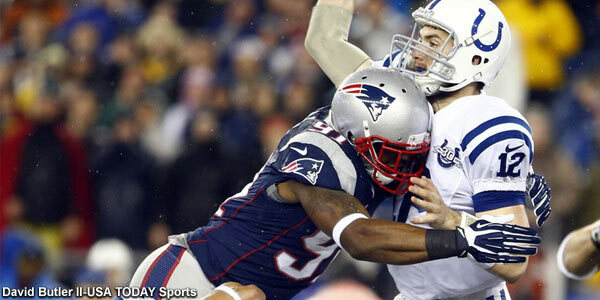 The Patriots defeated the Colts 34-27 in a score that was in essence much closer than the game would indicate. And the Colts have no one to blame but themselves after two of the more curious special teams calls that both failed and both led to Patriots touchdowns. None was sillier than the ridiculous trick formation that the Colts trotted out in the fourth quarter, down 27-21 and facing a 4th down and 3 from their own 37-yard line. Lining up in normal punt formation, the Colts entire team sprinted to the sideline. Then WR Griff Whalen ran back to line up to snap the ball, and Colt Anderson returned to line up under center. The Patriots didn’t panic and responded with Brandon Bolden and Jon Bostic right over Whalen and had the play more than covered. The Colts then did the unthinkable….they hiked the ball to Anderson on a play that no chance at success. Bolden smothered him immediately for a loss. And even had the play been successful, it would have gone for naught. They didn’t line up enough players on the line of scrimmage and got flagged. Bill Belichick, smiled as he declined the penalty and six plays later, Tom Brady hit LaGarrett Blount for an 11-yard touchdown and school was out for Indy. The Colts also tried a head-scratching on-sides kick after a fluky interception pick six by Mike Adams that had given them the lead. It nearly worked but close doesn’t count and it set the Patriots up for another short touchdown march. Belichick, who was maligned for weeks after a 4th and 2 call in Indy by going for it deep in the Patriots zone a few years ago can take a little satisfaction on stopping a play that is bound to be dissected for years to come. Brady and the offense not pleased: Tom Brady had a pretty solid outing on Sunday night, other than the pick that bounced off of Julian Edelman’s hands and right into Mike Adams’, but his demeanor after the game was one of sullen disappointment. The offense left some plays on the field and didn’t play as sharp as they have in week’s past. Although they scored 34 points, it was an uneven night for the offense that at times was clicking on all cylinders and at others stalled too many times. Unlike the Buffalo game where the Patriots let the Bills hang around by trying to put the nail in the coffin by getting away from what they do best and throwing deep on third and fourth and short, this time, they went a little too conservative too soon. They tried to pound the ball too much with LaGarrette Blount starting with about nine minutes to go and they let the Colts kind of hang around, even though they were up by two touchdowns. 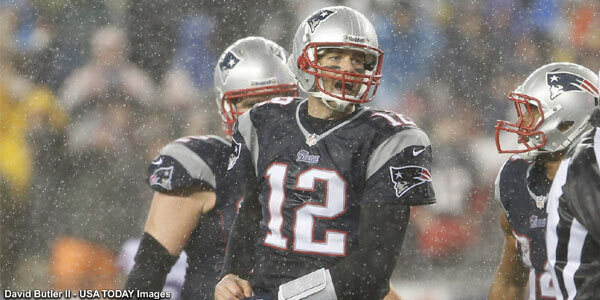 Brady’s numbers on the night were 23-37 for 312 yards, three touchdowns and one interception. His quarterback rating for the game was 104.8, which will actually bring down his season QB rating. Defense Adjusts, Shuts Down Luck, Colts in 2nd Half: The Colts came out after the opening kickoff in the first quarter and went quickly down the field and scored a touchdown to get their hopes up. They added a second touchdown drive in the first half and Andrew Luck was looking sharp. They were getting the ball out quickly, hitting the short crossing routes (much like NE), and weren’t allowing the Patriots to get their pass rush going. But the Pats defense under Matt Patricia adjusted well in the second half and ditched most of the soft zone coverages that they played in the first half and went back to more man coverage. The result was that the Colts were stymied in the second half until a garbage time touchdown with a minute left. The pass rush was much more effective and Chandler Jones registered 2.5 sacks and was beginning to get the better of LT Anthony Costanzo and also caused the tackle to hit with a few crucial penalty flags. Luck finished 30-50 for 312 yards and three touchdowns, but he was largely ineffective in the 2nd half. With Dont’a Hightower out with a rib injury, the Pats made the decision to playJonathan Freeny more than the veteran Jerod Mayo especially in the sub-packages. Mayo seems to have lost a step and Freeny was targeted in coverage, not his strong suit, a few times. The team missed Hightower’s blitzing up the A-gap. This will bear watching in the near future as Mayo’s snaps are way down this season. Malcolm Butler continues his strong play this season. He was solid in coverage and was contesting plays all over the field. He had a couple of plays that once again could have been interceptions. It is only a matter of time before they become picks instead of incompletions. Jamie Collins Shows His Athleticism: In Hightower’s absence, more was expected from Jamie Collins and he once again was very impressive. Collins was making plays all over the field in the running game, influencing things in the passing game in coverage and blitzed a few times effectively as well. He and Butler are the two most valuable players on the defense as Collins is playing at a Pro-Bowl level thru the first five games. His athleticism was on display after the Colts score with a minute to go. On the extra point attempt, the uber-athletic Collins vaulted over the defensive and offensive lines with a tremendous leap and then easily blocked Adam Vinatieri’s extra point attempt. Injuries Piling Up: After losing CB Tarell Brown and LT Nate Solder to IR this week, the Patriots were going with Marcus Cannon at left tackle. But in the Patriots first series, Cannon was visibly hobbling and left the game and didn’t return. In his stead, Cameron Fleming who was signed off the practice squad this week came in a played right tackle. That made Sebastian Vollmer slide over to left tackle in an exercise of musical chairs. But the offensive line did a good job of protecting Brady overall. Julian Edelman hurt his finger on the Patriots first touchdown drive. It bothered him the rest of the evening and he dropped a couple of passes that he normally catches easily including the one that Mike Adams returned for a pick six. Defensive end Jabaal Sheard who has been the team’s most effective pass rusher, got his ankle rolled up in the first half and didn’t return. Then late in the game, Matthew Slater, the team’s Pro Bowl special teams ace went down with what looks to be a serious knee injury. Blount with a big but not spectacular game: Patriots running back LaGarrette Blount got the majority of the reps this week, possibly because of Dion Lewis’ abdomen injury but probably because of his history in facing the Colts. While Blount didn’t have the eye-popping stats of his last few games against Indy he did have a very solid game, carrying the ball 16 times for 93 yards, including a 35 yard touchdown. He also notched his first career touchdown pass, an 11-yarder from Brady. He did a nice job of reading Brady’s roll out to the right and got wide open down by the goalline and rolled into the end zone. This entry was posted in Patriots Commentary, Patriots News and tagged 2015 NFL Season, Andrew Luck, Bill Belichick, Brandon LaFell, Chandler Jones, Chuck Pagano, Danny Amendola, Fake punt, Griff Whalen, Indianapolis Colts, Jabaal Sheard, Julian Edelman, LaGarrette Blount, Malcolm Butler, New England Patriots, NFL, Patriots, Rob Gronkowski, Tom Brady on October 19, 2015 by Steve Balestrieri. Aside from the highly anticipated annihilation of the Indianapolis Colts on Sunday night, there are several quality matchups which should be very competitive during the afternoon preliminaries. In the early afternoon Arizona travels to Pittsburgh looking to avoid a second loss after winning their first four games; that will not be an easy task at Heinz Field against a Steeler offense that boasts of Antonio Brown and Le’Veon Bell. 5-0 Cincinnati at Buffalo is a another compelling early game, and Denver – with their inconsistency on offense – may not have as easy a game as had been previously thought when they travel to Cleveland. There are also two good late afternoon games: San Diego at Green Bay, and Carolina at Seattle. In the New England area CBS will broadcast the Bengals-Bills game early, followed by the Chargers-Packers at 4:25 pm; Washington at the Jets will be the single game on FOX early. To see what is being televised in your area, check out the Week 6 NFL Maps at 506 Sports. The outcome for this game may hinge on which bad unit is worse. Denver can’t run the ball (31ˢᵗ in the NFL at 3.3 yards per carry) while age and injuries have caught up to Peyton Manning (28ᵗʰ in the NFL with 6.53 yards per pass attempt); the end result is the Broncos are averaging just 4.9 yards per play, 31ᵗʰ in the league – they would be last but the Bears had to put Jimmy Claussen under center for two games. The wretched Denver offense catches a break though, going up against Cleveland’s pitiful defense. Football Outsiders ranks the Browns’ D 28ᵗʰ overall and dead last against the run, so I suppose something has to give. Cleveland corner Joe Haden is out with a concussion, which should definitely help Manning. Josh McCown is on a hot streak (1,154 yards, 6 TD, 1 INT in last three games), but that was against the Raiders, Chargers and Ravens; Denver’s defense is far superior. The Broncos are allowing only 15.8 points per game (2ⁿᵈ best in the NFL) and have seven interceptions while allowing only three touchdown passes. The Broncos have had a knack for pulling out victories against inferior opponents even when they played poorly; I’m expecting the Denver defense to come through with some turnovers leading to the same result here. Andy Dalton gets a lot of crap for Cincinnati’s failures in the playoffs, but (a) this is still the regular season, and (b) that was in the past; this team looks different now. Dalton is completing 67.5% of his passes, has thrown 11 touchdowns with only two picks, leads the NFL with 9.49 yards per pass attempt, and his 115.6 passer rating is third only behind a couple guys named Aaron Rodgers and Tom Brady. He’s getting rid of the ball quickly, so that should negate Buffalo’s pressure from Mario Williams and Jerry Hughes from the outside. Buffalo QB Tyrod Taylor is out with a sprained MCL, so E.J. Manuel will get the start. At running back Karlos Williams is out with a concussion, as is Cierre Wood (knee), but LeSean McCoy (hamstring) may make an early return after missing the last two games – and wide receivers Percy Harvin (hip) and Sammy Watkins (calf) are both questionable. The Bengal defense should have no problem with Manuel and a less-than-100% McCoy. The Chiefs started out losing tough games to quality opponents (Denver, Green Bay, Cincinnati), but after losing to the Bears – and losing RB Jamaal Charles for the rest of the year – their season is done. KC is giving up over 31 points per game on the road. Kansas City NT Dontari Poe is out with a high ankle sprain; that should pave the way for a big game by Minnesota RB Adrian Peterson (93 yards rushing per game, 4ᵗʰ best in the NFL). Jacksonville quarterback Blake Bortles has a sore shoulder, and J.J. Watt got to him for six sacks last year. The Jaguars are giving up 29.0 points per game, second most in the NFL. Bill O’Brien may have mishandled the quarterback situation early in the season, but Brian Hoyer is playing better and deserves the start; he should have a good game against that suspect Jacksonville defense. Much maligned Chicago quarterback Jay Cutler could be in for a big game here. The Lions pass defense is awful; they rank dead last in opponent completion percentage (76.6%), yards per pass attempt (9.2), opponent passer rating (116.4), allowing nine touchdown passes with only three interceptions. Chicago’s pass D isn’t any better, so Matthew Stafford (three picks last week) could rebound here. The Bears have given up eleven passing touchdowns with only two picks and opposing quarterbacks are posting a 105.8 passer rating (28ᵗʰ). These are somewhat similar teams: good defenses that rely on the offense to not make mistakes and do just barely enough to win; the difference is that the Jets are better on both sides of the ball. Washington’s D played well in their first four games, but Devonta Freeman and Tevin Coleman ran right through the Skins to the tune of 156 rushing yards and 5.4 yards per carry. Some of that can be attributed to Washington having to respect Atlanta’s passing game, but I would still think that Chris Ivory should be able to run for plenty of daylight here. If Washington finds themselves in third-and-longs or behind on the scoreboard in the second half, you can count on Darrelle Revis picking off Kirk Cousins. A year ago Arizona was abysmal running the ball, finishing last in the NFL with 3.3 yards per carry. Head coach Bruce Arians has rejuvenated the offensive line and RB Chris Johnson has revitalized his career; the Cardinals now boast an NFL-best 5.0 yards per carry through five weeks. However, Pittsburgh has a solid run defense; expect Arizona to test a Steeler secondary that is allowing opponents to complete 70.4% of their passes (29ᵗʰ). While the revenge angle is focused on the Patriots this week, let’s not overlook that factor in this game. Arians did not have his contract renewed after the 2011 season, even though Pittsburgh made it to the Super Bowl. Pittsburgh fans and media pinned the blame on Arians, complaining that the Steelers threw the ball too much. Fast forward to present day, and all Arians has done is win Coach of the Year honors twice and breath life into a perennial loser of a franchise. The Fins finally dumped laid-back Joe Philbin, and replaced him with far more rigid Dan Campbell. On paper Miami is the far more talented team, and I would expect them to respond positively – at least in the short term – to the coaching change. I would expect Campbell to place more emphasis on running the ball – Miami ranks last in the NFL with 16.2 rushing attempts per game – and Tennessee is just 24ᵗʰ in the league against the run, allowing 4.4 yards per carry. If this was any other game between an undefeated team and a club with a losing record you would expect the 4-0 team to be favored – or at least not be a seven-point underdog. Carolina’s defense is very good, and should pose problems for the Seahawks. Carolina has limited opponents to 3.8 yards per rush attempt, and gets a boost with the return of linebacker Luke Kuechly. Corner Josh Norman is having an all-pro season but the pass rush may take a step back: LDE Charles Johnson is on in-season IR with a hamstring injury, and RDE Jared Allen is out with a bad back. Even without those two the Panthers should still have the upper hand against a mediocre Seattle passing game and porous offensive line that has surrendered an NFL-worst 22 sacks; overall the Seahawks are last in scoring touchdowns in the red zone (27.3%). Through week five Football Outsiders ranks the Panthers as the number four pass defense as Carolina has limited opponents to a 64.1 passer rating (3ʳᵈ), with those quarterbacks completing only 59.2% of their passes, picking off eight interceptions against just four touchdowns. The Chargers are in a really tough spot here: they have a bad offense, going up against one of the league’s best offenses, on the road on a short week following a difficult last-second loss. San Diego is giving up 26.8 points per game (23ʳᵈ), 5.1 yards per rush (32ⁿᵈ), 132 rushing yards per game (30ᵗʰ), 7.8 yards per pass attempt (25ᵗʰ) and 6.1 yards per play (28ᵗʰ). Meanwhile Green Bay is scoring 27.4 points per game (fifth best in the NFL), rushing for 126 yards per game (9ᵗʰ) with a highly efficient offense (13.2 yards per point, fifth best) that has only turned the ball over four times (also fifth best). Philip Rivers is a very good player (323 passing yards per game; 71.3 percent completion rate; 8.6 yards per pass attempt), but he needs lots of help from the rest of the roster keep this from being a blowout. What a difference a year makes. Twelve months ago a game between these two would be hyped to the point of exhaustion (Harbaugh Bowl! ); now it is just a forgotten afterthought between two teams with a combined record of 2-8. The Baltimore defense is a shell of its former self, between Terrell Suggs out for the season (torn Achilles), Haloti Ngata now playing for Detroit and Elvis Dumervil dealing with a groin injury. Baltimore is allowing 27.4 points per game (26ᵗʰ); by comparison they ranked sixth in the NFL just last year at 18.9 points per game. San Francisco’s primary issues are on the other side of the ball; the Niners rank last in the NFL with a paltry 15.0 points scored per game. After a couple of horrid games Colin Kaepernick looked better last week against the Giants, but at this point the rest of the season is just an audition so San Fran’s front office can decide whether Kaepernick is their quarterback for the future, or if they should bite the bullet and cut their losses after signing him to a $114 million extension in 2014. What can be said about this game that has not already been said? After watching Game Pass replays of the Colts first five games I will say that Indy’s run defense has improved. Rookie NT David Parry is better than I anticipated, as is his former Stanford teammate DL Henry Anderson. However, the Indianapolis defense appears to be extremely susceptible to quick short passes – and that is something that the New England Patriots execute better than any other team in the National Football League. Are the Pats going to be out for a pound of flesh in an act of revenge? I would be shocked if they were not. Note: in case you missed it, this game actually opened up with the Patriots favored by just five points. Hope you were as quick as I was jumping on that (pats self on back) with a full five units. Eli Manning has thrown ten touchdowns with only two picks, and is in the top ten in passer rating (100.2, 9ᵗʰ) and passing yards per game (283, 8ᵗʰ). However, the Eagles do a very good job of forcing turnovers (13, 2ⁿᵈ most in the NFL). I see this as a game that could easily go either way, decided by a field goal; in other words, take the Giants plus the points. This entry was posted in Uncategorized and tagged 2015 NFL Season, against the spread, Andrew Luck, betting line, Indianapolis Colts, New England Patriots, NFL, odds, Patriots, Pats, picks, predictions, Tom Brady, Week 6 on October 17, 2015 by John Morgan. In a this weeks column, 98.5 The Sports Hub Patriots radio play-by-play broadcaster Bob Socci provides his insight and predictions for this upcoming week six matchup with the Indianapolis Colts on Sunday. Who is your breakout player for either Indianapolis or New England this week? What Patriots unit do you believe has to make the most improvement/adjustments going into this week? This entry was posted in Patriots Commentary, Patriots News and tagged Andre Johnson, Andrew Luck, Bob Socci, LeGarrette Blount, Rashaan Melvin, Robert Mathis, Social Media, Trent Cole on October 17, 2015 by Robert Alvarez. The New England Patriots and the Indianapolis Colts meet on Sunday Night Football for a rematch of last years’ AFC Championship Game. The primetime matchup will be televised by NBC with the announcing crew of Al Michaels, Cris Collinsworth and Michelle Tafoya on the call. Kick-off is scheduled for 8:30 p.m. ET. Indianapolis (3-2) has gotten off to a slow start in 2015 and although they’ve won their last three games, they haven’t been the team that many experts picked to represent the AFC in this season’s Super Bowl. Last week backup QB Matt Hasselback led the team to a 27-20 win over the Houston Texans. Quarterback Andrew Luck and CB Greg Toler are expected to play for the Colts this week which should be a big boost for the team on both sides of the ball. New England (4-0), won at Dallas last week 30-6 after a slow start to the game that saw Tom Brady sacked five times in the first half. But the offense made their adjustments and Brady was laser-sharp in the second half going 10-11 for 165 yards and two touchdowns. More importantly, they allowed zero sacks. The defense held the Cowboys to a pair of field goals and generating two turnovers. It was their best performance of the year to date but in the process they lost LB Dont’a Hightower to a rib injury. His status is unknown for Sunday. Series History: The Patriots and Colts will meet for the 80th time on Sunday and this series has been dominated by New England. The Patriots hold a 50-29 edge overall including a 21-17 advantage on games played in Indy. The Patriots have won the last six meetings including two last season; a 42-20 win in Indianapolis and a 45-7 win in the AFC Championship Game in New England. 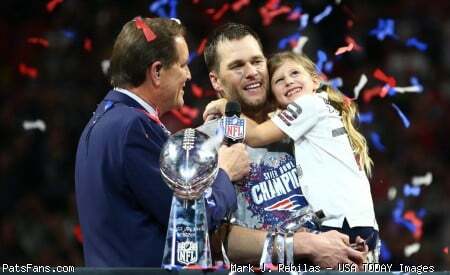 This entry was posted in Patriots Commentary, Patriots News and tagged 2015 NFL Season, Andre Johnson, Andrew Luck, Bill Belichick, Chandler Jones, Coby Fleener, Danny Amendola, DeflateGate, Frank Gore, Indianapolis Colts, Jabaal Sheard, Julian Edelman, LaGarrette Blount, Malcolm Butler, New England Patriots, NFL, Patriots, Patriots edge rushers, Phillip Dorsett, Rob Gronkowski, Rob Ninkovich, T.Y. 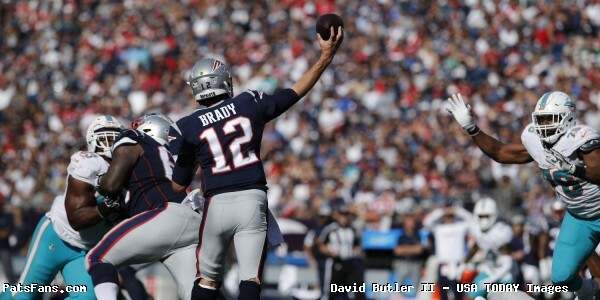 Hilton, Tom Brady on October 15, 2015 by Steve Balestrieri. The Patriots go back on the road this week as they travel to Indianapolis to take on the Colts in a rematch of last season’s AFC Championship Game. The game is slated for a prime time Sunday Night Football on NBC. Kickoff is slated for 8:30 p.m. and NBC’s announcing crew will consist of Al Michaels and Cris Collinsworth handling play-by-play and analyst duties with Michelle Tafoya on the sidelines. The Colts (3-2), won their third game in a row last Thursday night with a 27-20 win over the Houston Texans. Running back Frank Gore had 98 yards rushing on 22 carries and WR Andre Johnson had his best game of the season with 6 catches for 77 yards and two touchdowns against his former team. Quarterback Andrew Luck is slated to return to action this week from his injury, he was a full participant in practice on Monday. Another sign that he’s fully healthy was the team releasing QB Josh Johnson early this week. 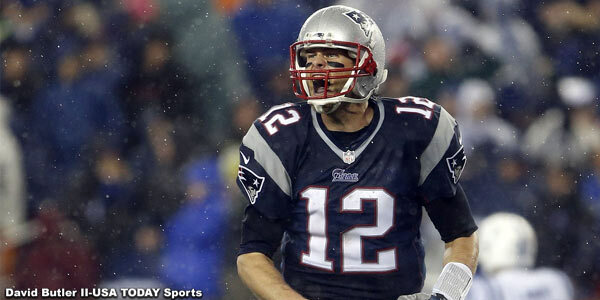 The Patriots (4-0), overcame a slow first half to defeat the Dallas Cowboys 30-6 on Sunday. Tom Brady was sacked five times in the first half but was very sharp going 10-11 for 165 yards and two touchdowns after halftime to lead the Patriots. The Patriots defense held Dallas to just a pair of field goals and forced two turnovers. This was easily the best game of the season for the defense. They held Brandon Weeden to only 188 yards passing and the Cowboys to only 264 yards in total offense. Focus on the Trenches Once Again: The Patriots have dominated the last few meetings between the two teams and have done so by completely winning the battle up front on both sides of the ball. That will once again be a key area to focus on again as the Colts have revamped their defensive line with three new starters. With Arthur Jones down with injury, the Colts now go with David Parry as the nose tackle, flanked by Kendall Langford and Henry Anderson at defensive end on the defensive front. This will be a key area to watch. The Patriots with LaGarrette Blount and Jonas Gray have dominated in the running game for the last three meetings averaging 219 yards rushing and this is something the Colts must improve upon this time. The offensive line play has improved in recent weeks and with Gore finally giving Indy a running game, it will take a lot of pressure off of Luck to have win the game single handedly. Their play against an improved Patriots front seven will be another key area to watch. Pass protection for Luck will be an area that Indy will want to improve upon as the Patriots have been able to get to him and force him into bad decisions and throws in recent meetings. Turnovers Plaguing The Colts: Through the first five games of 2015, Indianapolis ranks 31st in the NFL with a minus seven turnover ratio. Colts quarterbacks have tossed seven interceptions and the team has lost five fumbles. They’ve only been able to add five interceptions and no fumble recoveries yet on the season. Facing a Patriots team that is always in the top five of turnover ratio and is lighting up the scoreboards for over 37 points per game, this is one area that the Colts coaches will be driving home all week. Losing the turnover battle against New England this week, would almost certainly spell defeat for the Colts. And with a defense that has done well at creating some turnovers against Tom Brady in the past, this will be a prime time for Indy to force Brady into his first interception of the season. Will New Offensive Players Gore, Johnson Hold Up: The Colts in free agency this season opted to beef up the offensive side of the ball by bringing in two big signings in Frank Gore and Andre Johnson. But one has to wonder if the age of both players will impact their effectiveness down the stretch. Gore at 32 is at an age where big, powerful running backs begin to show the wear and tear of their profession. He easily had his best game of the season last week and gave the offense a needed shot in the arm. The bigger question is, can he continue to be an effective runner late into the season and in the playoffs for Indianapolis? The Colts haven’t had an effective running game in years and if he begins to wear down, they’ll back to square one. Johnson also had his best game of the season with a solid effort against his former team. He looks like he’s lost a step in the passing game but the emergence of Donte Moncrief as the #2 WR behind T.Y. Hilton may ease Johnson into the complimentary 3rd WR role, which he can still be effective at. Pressure is on Luck this Sunday: When he entered the league, Andrew Luck was touted as the next great QB and he’s put up some great numbers. But in each meeting with the Patriots, the press, ever anxious to anoint him as the new top QB of the league and passing by Brady, he’s failed badly. Luck is still looking for his first win against New England and has yet to play an impressive game against a Bill Belichick defense. After a much hyped offseason where the Colts spent free agency and their top draft pick on offensive players, they started poorly and Luck, prior to his shoulder surgery was off to the worst start in his career with five touchdowns and seven interceptions in three games. Indy has plenty of offensive weapons for him to choose from, but Luck is going to have to limit the big mistakes that have plagued him against New England in the past. Perhaps now, with the expectations tempered by the Colts slow start will be a perfect opportunity for him to finally have a big game against the Patriots. Indy Linebackers have tough test: Facing the Patriots this week, the Indianapolis linebackers will have a tough task. 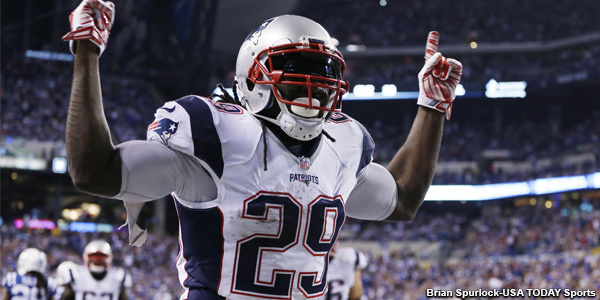 The Patriots love to mix things up in the running game with LaGarrette Blount and Dion Lewis. This is something they’ve been successful doing in the past and the Colts linebackers will have to be active in run support. But with Lewis out of the backfield coupled with Rob Gronkowski in the passing game, the task becomes even larger. If there’s one area that is the most glaring matchup that favors New England, it will be the passing game targeting the linebackers, an area that the Colts haven’t addressed this season. They don’t cover the tight ends exceptionally well and Gronkowski will be a big focus of the defense this week. Even getting back CB Greg Toler this week, this will be an area where the Colts will not only have to improve, it will be an area the Patriots will look to exploit. 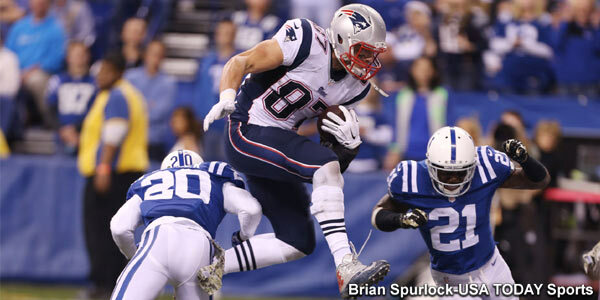 This entry was posted in Patriots Commentary, Patriots News and tagged 2015 NFL Season, Andre Johnson, Andrew Luck, Bill Belichick, Danny Amendola, Donte Moncrief, Frank Gore, Indianapolis Colts, Jabaal Sheard, Julian Edelman, LaGarrette Blount, New England Patriots, NFL, Patriots, Patriots edge rushers, Rob Gronkowski, T.Y. Hilton, Tom Brady on October 14, 2015 by Steve Balestrieri.